Then she knelt down and prayed for help, and while she prayed a guardian fairy appeared and made a channel in the water so that she was able to pass through on dry ground. When she entered the garden the fairy was with her, although she did not know it, so she walked to a tree full of beautiful pears, not knowing they had been counted. Being unable to pluck any without hands, she went quite close to the tree and ate one with her mouth as it hung. One, and no more, just to stay her hunger. The gardener, who saw her with the fairy standing near her, thought it was a spirit, and was too frightened to move or speak. After having satisfied her hunger, the maiden went and laid herself down among the shrubs and slept in peace. –"The Maiden Without Hands", The Complete Brothers Grimm Fairy Tales, 1981 Chatham River Press. The next night, with the fairy's help, the maiden eats another pear and is discovered by the king who takes her in and befriends her, and gradually falls in love with her. After silver hands, marriage, separation by war, the birth of a son, intercepted and deviously altered letters, fleeing the castle and finding a safe haven, eventual regrowth of hands, and reuniting after seven years, I imagine a celebratory feast would include these beautiful pears as a symbol of the first time the maiden and the king met. 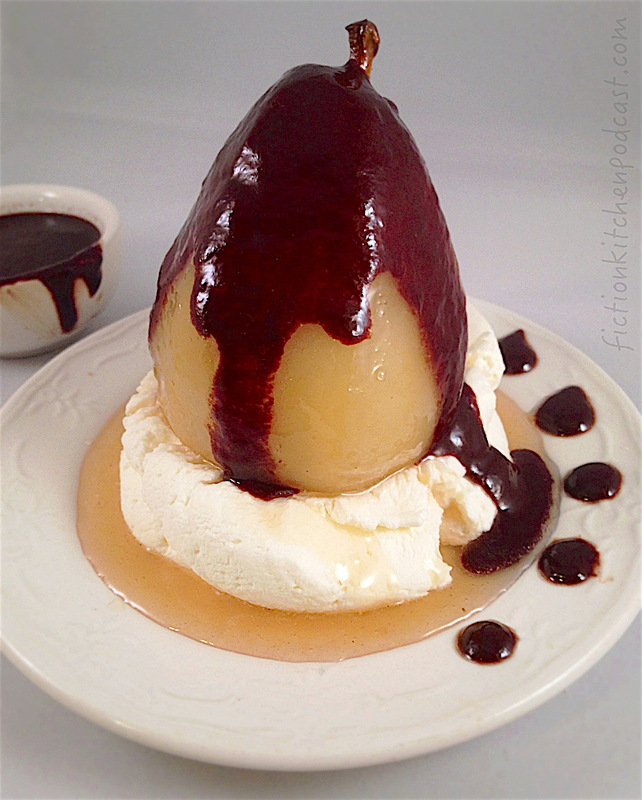 This recipe is also known as 'Belle Helene' or 'Beautiful Helen' ('Birne Helene' in German), inspired by the comedy operetta of the same name ("La Belle Helene") written by German-born composer Offenbach, which in turn is based on the Greek story of Helen of Troy's elopement with prince Paris. In a medium-large, heavy bottomed pot, over medium-low heat, combine the 1st 5 ingredients & heat until the sugar dissolves, creating a sugar syrup. Turn the heat to low. Peel the pears, keeping the stems intact, & then slice a little bit off the bottoms so that the bottoms are level. Take out as much of the cores as you can without breaking the pears, & then place them in the pot, turning them around to coat in the syrup. Cover the pot & let simmer for about 5 minutes, & then turn the pears & spoon syrup over them. Cover again & wait another 5 mins & turn again & spoon syrup. Continue to turn the pears occasionally & coat with syrup until the pears are tender & a fork or knife can easily slide into them, about 20 mins or so. Turn off the heat & carefully transfer the pears to a container in which they can stand upright & spoon more syrup over them. Place them in the freezer to cool for several minutes (this is the quickie way, otherwise let cool in the pot, upright). Heat the heavy cream in a small bowl in the microwave for about 45-60 seconds, or until hot to the touch. Add in the chocolate pieces, let them warm for a minute, & stir until fully melted & smooth. Add in a spoonful or 2 of the syrup from the pot & stir to incorporate. Spoon more pear syrup over the cooled pears. 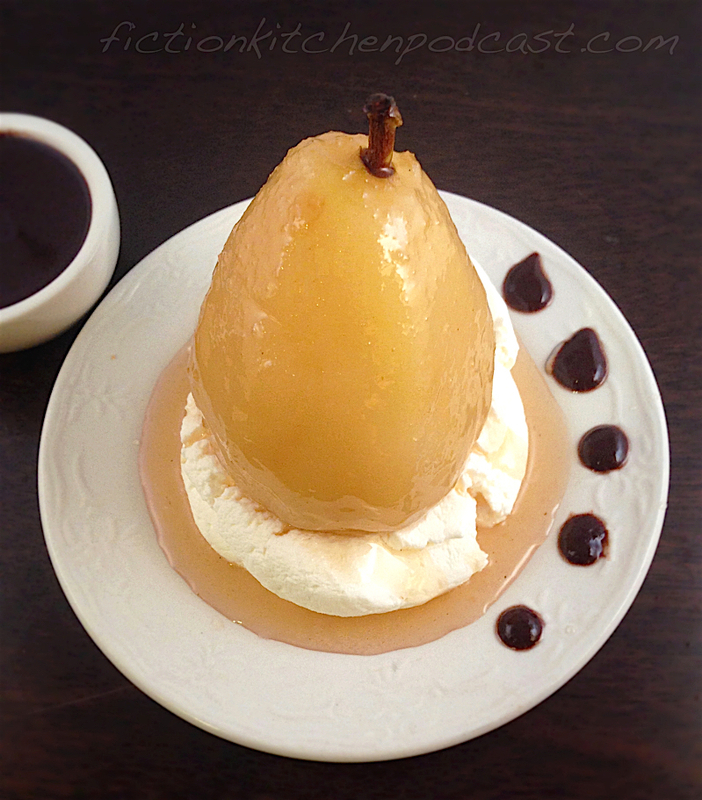 Place a large scoop/dollop of vanilla ice cream or whipped cream in the center of a serving dish & place an upright cooled pear on top (if using ice cream, create a little crater for the pear to sit in). Spoon more of the syrup over top & serve with the chocolate sauce on the side (then the recipient can pour it on as they like).